To clean up Michigan’s oil disaster, undocumented workers are being exploited after agreeing to take high-risk jobs injurious to their health. In June, I wrote about federal immigration enforcement agents targeting workers cleaning up the the biggest oil spill in United States history to check their immigration documents. 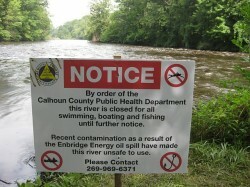 While no one was detained on site, new evidence reveals that some of the workers contracted by Enbridge Energy in Michigan to clean up the Calhoun County oil spill may not only be undocumented, but were made to work in hazardous conditions. An investigation by Michigan Messenger (by Change.org Gay Rights blogger Todd Heywood) reveals that Hallmark Industrial — an oil spill cleanup contractor based in Texas and subcontracted by Enbridge Energy — has been busing in hundreds of allegedly undocumented workers to work on the cleanup of the Calhoun County oil spill in Michigan. Following the investigation, Hallmark was fired from the cleanup effort, leaving some of the workers unsure about whether they would be compensated for the work done. Hiring undocumented workers as independent contractors is not main problem here. What’s really concerning is that the workers were expected to work nearly 100 hours a week in unsafe conditions, with 12-14 hour shifts per day, seven days a week. Photographs obtained by the Michigan Messenger reveal numerous violations of OSHA safety standards, including evidence of workers covered in oil and mud getting food and water. The fact that workers may not possess legal right to work in the United States did not give Hallmark or Enbridge any legal right to abuse and exploit them under fair labor standards and practices. We know from the BP oil spill cleanup efforts that prolonged exposure to similar conditions can result in a multitude of illnesses including, but not limited to, “headaches, dizziness, fatigue, nausea and problems with memory and concentration.” Homes in West Michigan had to be evacuated due to the oil spill. There is little doubt that the allegedly undocumented workers were assuming a risk to their lives and health by helping clean up this oil spill for as little as $8 an hour, food on the job site, and a hotel room. Maybe some American citizens would be willing to assume the same risks in this dire economy. But to avoid a race to the bottom with regard to worker health and safety issues, we need strictly enforce fair labor standards regardless of immigration status, so that unscrupulous employers are less willing to place the most vulnerable and desperate workers in unsafe conditions with little compensation.